Land of Leather has ended talks with possible buyers, saying the potential offers had indicated "insufficient value for shareholders". On 1 December, Land of Leather said it had received a number of "unsolicited expressions of interest" in the firm. It has issued three profit warnings in the past year, and has said orders fell 47% in the three months to 2 November as the retail sector weakened. 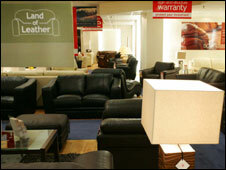 Land of Leather has 109 stores in the UK and the Irish Republic.